So now you've read Part One of my Guide to Cloth Diapering with Wool and you're convinced you want to try wool. What next? This will cover everything you need to know! HERE ARE SOME OF THE MANY GUIDES I'VE PUT TOGETHER. 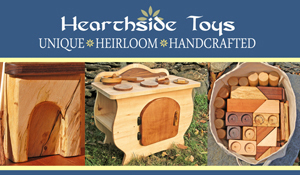 MAKE SURE TO CHECK THEM OUT TOO! *NOTE: I have not used all of these products, but am listing them as "recommended" based on common use among experienced users in the wool diapering community. It is by no means all that is available - there are lots of wool care brands out there. It is not necessary to buy "wool wash" with lanolin, but it is certainly OK to do so if you like. 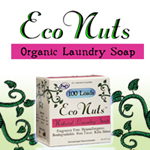 Many use liquid baby soap (see brands below), or delicates wash. I personally used Ecover Delicates Wash to wash my wool, Seventh Generation Dish Liquid if it was really dirty, and thin shavings of Ewe Need It wool wash bar to emulsify my lanolin. When removing stains on knits, it is important to be gentle and try not to rub but instead, pinch the stain remover into the knit. Rubbing the fibers together (the way you would to scrub a cotton garment) may cause felting. However, with interlock you can rub the stain remover of your choice onto the wool freely. Seventh Generation Free and Clear Dish Liquid - great for stripping wool too! 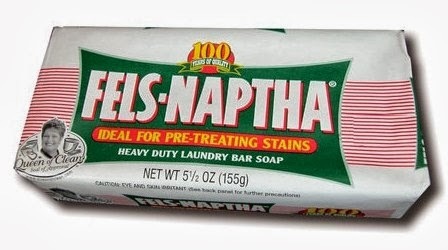 Fels Naptha - found at most grocery stores and big box stores, it is one of the more widely used stain removers in wool diapering circles, but it does not have the most natural ingredients. Use with caution though, as some have reported fading after soaking with it. It is good to occasionally strip wool of lanolin, particularly when storing it for a long period of time or if it starts to smell funky. Soaking it with the soap listed below for a good 15 minutes and then washing with it should remove the lanolin. 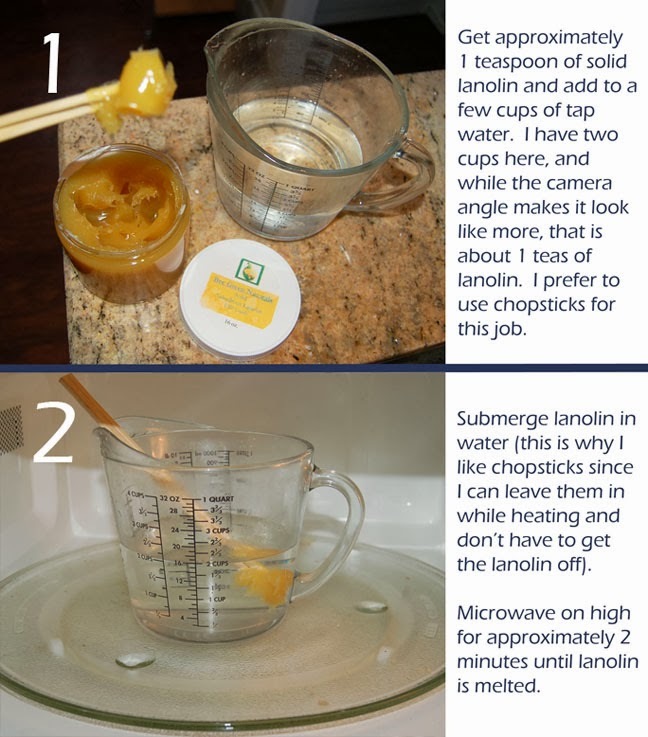 You may need to repeat several time to remove all of the lanolin, depending on how lanolized the piece was. This is also good for extra dirty wool. You always, always want SOLID lanolin. Not liquid, unless you're using spray (I'll get to that) and while some say it's OK to use Lansinoh, the general consensus is that most people have issues with it not lanolizing properly, so it's best to stick to SOLID lanolin. Not to be confused with "liquid lanolin," spray lanolin can provide a little boost between officially lanolizing your wool again. Also, some who use interlock don't do lanolin baths and only use spray lanolin on the wetzone. The reason being that interlock is already partially felted, which pulls the fibers closer together and makes it denser and more leak proof than knits. For those who want to try wool but are scared of hand washing, I'd give interlock a try. 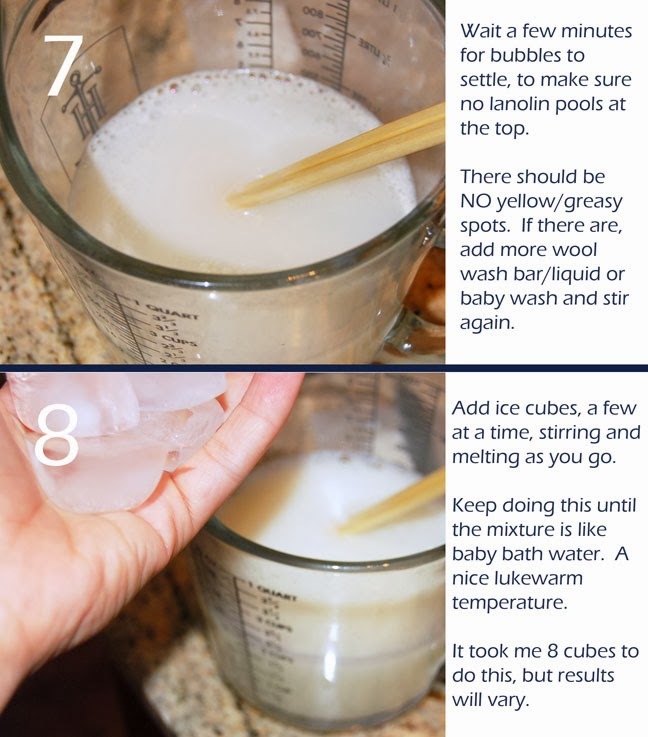 You can technically wash it in a washing machine, and provided you change the diaper frequenly, you may be able to get away with using a lanolin spray instead of soaking in a lanolin bath. For more information on the difference between interlock and knits, see Part One of my wool post. Yes, if you want to keep those little pesky pills at bay and keep your wool looking nice, you will need to shave it. It is not absolutely necessary of course, as it is mostly it is for aesthetic reasons, but if you want to shave it there are instructions below and you will need either an electric shaver or a pumice stone. 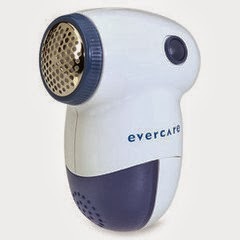 The small (not the giant) Evercare shaver, sold at many stores, is widely recommended. It is important to shave your wool BEFORE washing/lanolizing, so the blades don't get clogged up with lanolin. I owned this small Remington shaver, and I think it shaves better, but it is a major pain to keep the battery cover and the lint catch from falling off while shaving. As I will detail in the instructions below, some use pumice stones as well with success. This is a great plastic free option! And according to Shannon of Woollybottoms, it is far more effective! There are typically four measurements discussed when talking about wool and diapers. When measuring your child, all measurements are taken with a diaper on, to ensure proper fit over the diaper. It is easiest to use a flexible measuring tape. Rise: this is the distance from front to back measured between the legs over the diaper, but snug against the diaper. Start measuring from one side of the waistband (i.e. front) and pull the measuring tape between the legs to the other side and end at the waistband. See the video for the demo. This is the FIRST measurement she takes in the video. When measuring your child, YOU WILL WANT TO ADD AT LEAST AN INCH TO THIS MEASUREMENT, to ensure that the wool completely covers the diaper. Inseam: Since the pant leg starts centered between the legs, with the diaper on, start centered between the legs and bring the tape measure down along the leg (as the pant would fall) and end where you want your pant leg to end. 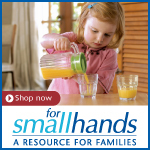 Don't forget to account for future growth spurts! :) Pant legs can always be cuffed initially. This is covered in the video as well. Waist: This is taken at the top of the diaper, similar to where you would measure your waist on yourself. See the video for demo. Hips: Some swear that a hip measurement is more accurate and necessary than the waist, so with the diaper on, measure directly around the hips. Thighs: Simply measure around the top of each thigh where the diaper meets the leg to figure out the size leg holes you will need for soakers or covers. You will want to wash your wool when you can smell the urine even when it is dry. It is not unusual for the urine smell to be there when you first take it off and it's wet, but after the chemical reaction happens (see Part One for details), it should be converted to salt and water and no longer smell. However, once the urine salts build up and it smells of urine while dry, it's time for a wash! Of course, it is also appropriate to wash when it's visibly dirty. No matter what type of wool you have, the most important thing is keeping the temperature lukewarm - not too hot or too cold, so you don't shock the wool fibers with a drastic temperature change. Many describe the temp like baby bath water. You can use any product from the "Washing Wool" Supplies section above, and let it soak for a few minutes. If you are using a wool wash bar, just run water over it and use your hands to suds it up under the running water to fill your wash water. Always remember to never wring it out, just squeeze gently to work the soap into it. If it's really dirty, you may need to wash it a few times until the water runs clear. Note that some wool may bleed a bit, so it's important to distinguish what is dye vs. dirty water. With knits and upcycled wool, it is important to always hand wash, and take care not to agitate the fibers and rub them together too much to prevent felting. For more information on felting, see Part One. With interlock you may handwash or use the wool setting on the washing machine. I didn't have a wool setting, but never had any problem using the delicates setting on my machine. However, sometimes I would have to flip the temp setting back and forth while it was filling to get the water temperature right before adding my wool, and since I only had cold rinses on my machine, I would usually reset it for the wash cycle and fill again as before, or just rinse it by hand. For stripping and stain removal, see the "Supplies" section above. Once your wool is clean, you can add it to STEP 12 of the lanolization tutorial below. NEVER LANOLIZE DIRTY/UNWASHED WOOL. If your wash water has cooled (which is fine, as long as it does so slowly and not instantly), you may want to very gradually warm it up until it is the same temp as your lanolin bath. 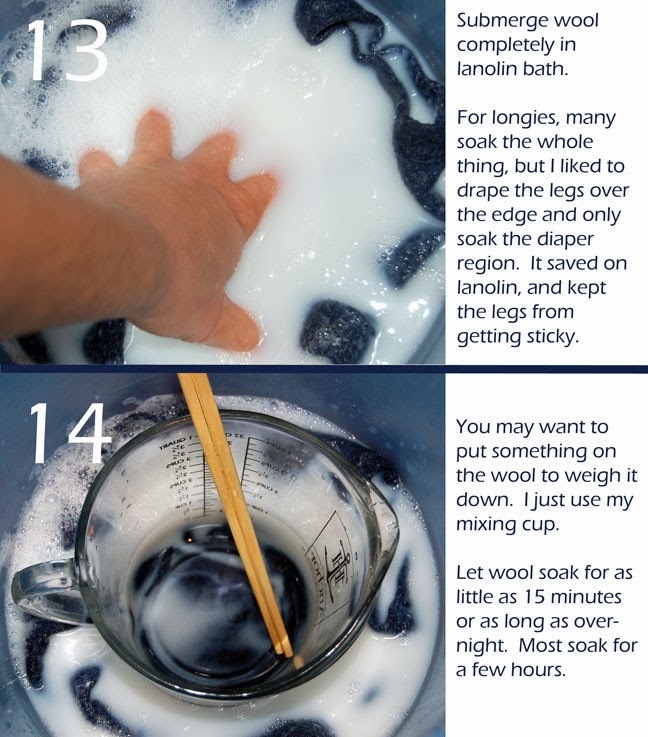 Then squeeze out the excess water and add to the lanolin bath in STEP 12. I'm not going to lie, I struggled substantially with my lanolin mixture for, well, just about the entire time we used wool. UNTIL... I learned a trick at the very end. 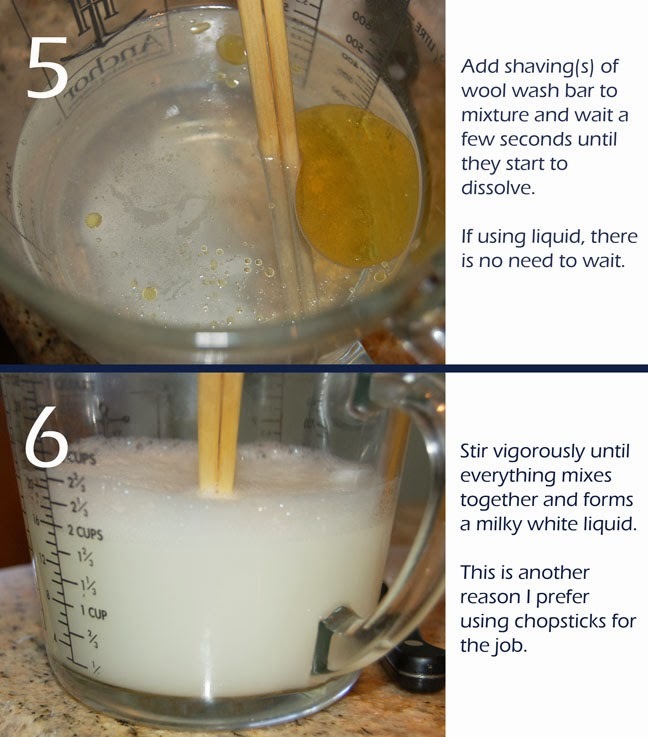 In the beginning I was using Ecover Delicates Wash to emulsify my lanolin (often recommended in the wool world), and I don't know if it was our super hard water, but I had a hard time getting the balance and getting the lanolin to emulsify. Either I'd give up and still have yellow pooling at the top, or I'd add too much soap and when everything was done it was hardly lanolized and all a waste of time. Once I figured out the mix, and the fact that out of all the options, solid wool bars seemed to work best for me, I was still having issues with floaties. 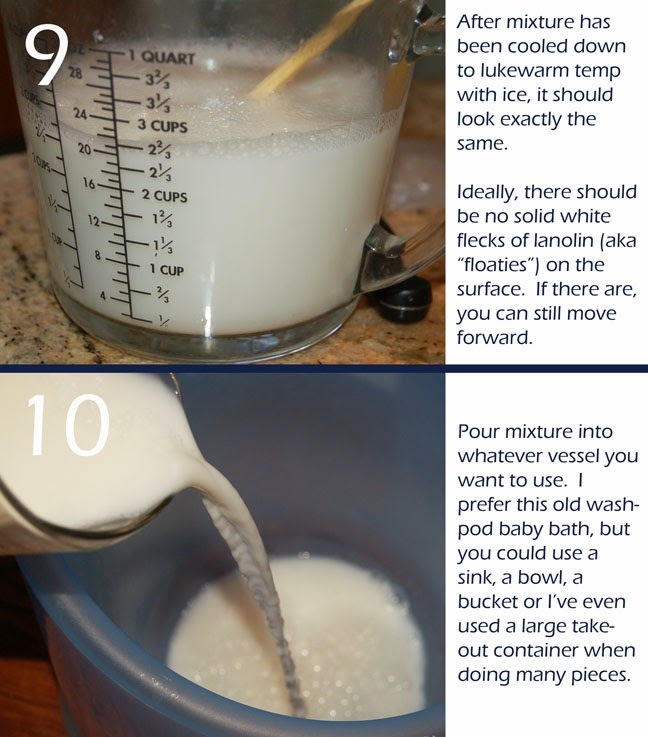 This supposedly happens when the mixture is shocked with cooler water and cools down too quickly, the already emulsified lanolin floats at the top of the water in solid white flecks. I continued to use wool because out of all lanolizing issues, this is not that problematic. All that happens is you will see those white flecks stuck to your wool, but once it dries you'd never know they were there. But I still longed for the perfect milky bath. I'd try to leave the lanolin mix alone for hour(s) until it cooled down on its own without adding any additional water, but the floaties still showed up. Then one day someone was talking about the "ice trick" on one of the chat groups. It defied all logic. I was intrigued but skeptical. I could kiss the person who introduced it to me! I could not believe the results! And it makes it so easy, because there's no fussing and waiting for it to cool. It's ready to go as soon as you're all done. So that is something very different about my tutorial - using ice to cool the mixture. It is shockingly effective and easy! Another thing I mention is not lanolizing the entire pair of longies, legs and all. There are some that argue that the lanolin conditions the wool and is necessary to keep it silky soft. Based on my own experience, I disagree, but I'm sure everyone is different. 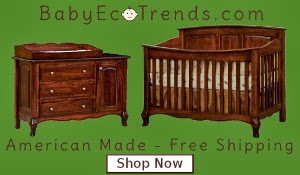 I had longies that went through two winters, and I lanolized them the same way every time - only soaking the part that goes over the diaper and leaving the legs draped over the edge of my baby tub (it's like a bucket). Actually, I would moreso drape them over whatever I had inside the bucket to keep the longies submerged. Once the lanolin had worn off the top section, and they were due to be washed, I never noticed a difference between the lanolized portion and the legs. I found this extremely useful for a number of reasons. First, it kept them cleaner, since the legs themselves were not sticky (even though some moms like how it conditions the skin of their baby's legs). Second, it dramatically reduced drying time! The lanolin definitely slows the drying process, and obviously out of all wool pieces, longies take the longest to dry. Without lanolin on the legs, it took less than half the time to dry, including the lanolized part. And finally, lanolin isn't cheap! It was definitely a means of conserving lanolin. This is another area I personally struggled with mastering, UNTIL I discovered the ice cube method which made whipping up a batch super quick and easy. I would recommend starting with making a single batch above, and once you're familiar with the process, you can try to double or triple your amounts. For me, I just used mason jars and would whip up 2-3 batches at a time, alternating while I was preparing one I'd have another in the microwave, but you can certainly make it all in one container if you like. I would ultimately just pour the contents from all the jars in my tub and do 3-4 pieces together. Just keep in mind when washing or lanolizing more than one piece, to KEEP LIKE COLORS TOGETHER in case any of them bleed on one another. 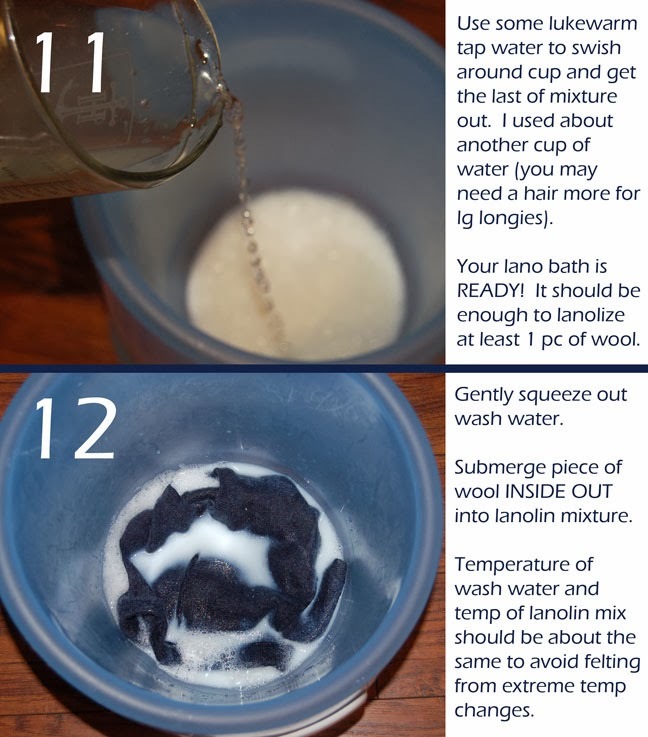 Once your wool is done soaking in the lanolin bath, you have two options to get the water out. The first starts by gently squeezing the wool (NEVER wringing - it can cause felting) to get as much excess water out as you can. Then lay it on an absorbent towel, roll the towel up and compress it to try to wick as much moisture as possible from the wool to the towel. Then lay it flat to air dry. The other way, which is what I've always done, is if you have a spin only cycle on your washer, you can either squeeze the water out first or just throw it in the washer dripping, and let the washer spin it out for you. My spin cycle did have two spurts of water in the beginning, so I would start it, wait out those two bursts of water to finish (so it didn't rinse off any lanolin) and then I would add my wool . 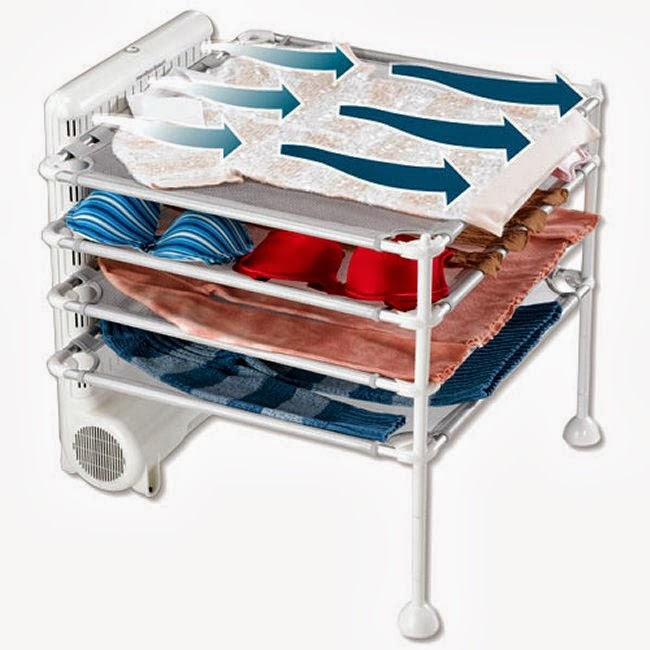 You can dry your wool just about anywhere on any drying rack, but here is a coveted drying rack that blows air to the different levels. It's called the Hamilton Beach Quick Dry 4 Shelf Garment Drying Station. Unfortunately, it is very difficult to find new. It dramatically reduces drying time, and if you use wool full time it is definitely worth considering and searching for! When it's dry, your wool should feel slightly tacky to the touch in the areas that soaked in lanolin. Some like to add even more lanolin and make it very sticky, which is fine too! If you want to keep your wool looking happy, then you will occasionally need to shave it when it starts to get covered in "pills" (those little tiny balls all over the wool). Whichever method you choose to shave, you will want to inspect knits and upcycled wool for any stitches that may be sticking out. If you shave them off then you can start a hole. It is rare for this to happen, but if you see a stitch sticking out, then simply take a toothpick and push it back through. See the video below, found on the Sloomb website, for more on this. It is important to shave your wool dry and BEFORE lanolizing, so for most this means before washing as well. The less lanolin the better, as you will clog up your blades and your electric shaver will meet its demise rather quickly, and if you are using a stone I can imagine lanolin would be problematic as well. When using an electric shaver, you can go any direction you choose (some prefer up and down/side to side, some do circles...it really doesn't matter), but take care not to press TOO hard. This is another way you can accidentally put a hole in your wool. Don't be too scared though! When doing the main part of the piece (minus the edges - see note below) you can use a fair amount of pressure! You just don't want to be grinding the shaver down on the wool super hard. Take great care around all edges! The top edge of the waistband and the bottom edges of the legs are major places for pills to form, but they are also easy places to lop a stitch off of knits (this is not a problem for interlock) if you press too hard. Shannon of Woollybottoms has written a wonderful blog post on the benefits of shaving with a stone. You can see her photo of her results here. Believe me, Shannon has to shave A LOT of wool! Had I known of this post prior to my daughter potty learning, I definitely would've given it a shot! Help! My wool is bleeding on my diapers or it bled on another piece of wool! - Dye transfer between wool pieces is difficult to remove, but you can always try to soak in Fels Naptha. The best way to avoid this is to group like colors together or wash/lanolize individually. Bleeding on diapers will usually wash out from the diapers in a few washes. For more info, see "Bleeding Wool/Resetting Dye" below. I added the soap to the melted lanolin and water and mixed it, but there are still yellow blobs floating at the top of my whitish mixture. - Simply add a little more soap (just a little at a time) and stir again until the yellow is gone and the mixture looks like milk. I got my mixture just right and looking like milk, but then little white chunks of lanolin are floating at the top of the mixture. - These are referred to as "floaties" and usually result from the lanolin mixture cooling too quickly. I have tried adding hot water and trying to fix it, but personally I was never successful (perhaps some out there have been able to fix it). But don't worry! You can still move forward. You will see the white blobs on your wool when it is wet, but when it dries, they will be unnoticable. My wool feels really, really sticky. - This is fine! The lanolin will wear off pretty quickly. Most aim for their wool to feel slightly tacky when dry, but some deliberately add extra lanolin to make it sticky so it lasts longer - particularly nighttime wool. But if you don't like it sticky, add a little less lanolin next time. My wool doesn't feel tacky or sticky at all, and the pee is coming right through it. - There is such a thing as over-emulsifying the lanolin. It means you added too much soap to the mix or not enough lanolin. Add less soap or more lanolin next time. My wool is scratchy and unpleasant! - This happened to me when I purchased a few hand knit items, and admittedly my Disana leggings were not as soft as I expected. This is easily solved with a soak or two in Ecover or Mrs. Meyers fabric softener. While this is somewhat controversial and not recommended by everyone, I have personally soaked my wool for even a few hours and had no problems. I have also discussed this with a seasoned administrator of a wool chat group who recommends the same, however, not all will say to do so. But I have used Ecover and Mrs. Meyers to soften wool (machine knit, hand knit, upcycled and interlock) many times without any issues. It is important to ONLY use one of these two brands, as they are also recommended for softening cloth diapers because they do not affect absorbency. Usually I added it once the wool is clean to the final rinse water and let it set for a while before putting it in the lanolin bath. Please know that there are SO many things that can go into creating a bleed issue, many of which are outside of our control (like the daily composition of a child's urine, even). The chemical balance in the water can change, and that can set up any number of bond changes with any number of dye techniques (be it interlock, knit, etc). 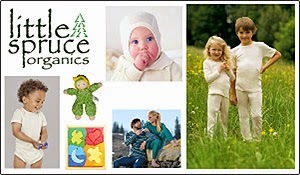 Do not panic if you get some dye on your diapers or clothes, the dye that is used on wool products is not the same type of dye used on cottons/bamboos/polyesters, etc... Your diaper may turn a slight shade of the dye, but this will wash out after a few washes. First, wash the item in tepid water with dish soap until the water is clear. Do not use wool wash for this, you want to use something like Seventh Generation Free and Clear Dish Soap (like you use for stripping). Fill a large pot with a mix of 3 parts white vinegar to 1 part water (use enough liquid to totally immerse your cover/longies). Add your wool and push the wool down until it is immersed. Turn your stove to medium-high heat. When it gets hot and steaming (almost a boil), slowly turn down your stove to maintain a simmer. Avoid heavy agitation. Turn the stove off and remove from heat and allow the wool and vinegar mixture to return to room temperature together. Gently remove your cooled piece of wool and squeeze out the vinegar. IT IS IMPORTANT TO LET IT COOL DOWN GRADUALLY TO ROOM TEMP!!!! You will NOT felt your wool as long as it is not exposed to drastic temperature changes combined with agitation. Gently rinse the wool in a sink of lukewarm water, squeeze out and then wash normally to remove leftover vinegar. Your dye should be set now. Your water should be virtually clear with no color leaching into it. If this continues to be a problem, you may have "touchy water" or a product scent that is causing your dye to loosen. Try switchign to unscented or EO (essential oil) rather than FO (fragrance oil) products. You can follow these instructions again, to try to reset the dye. Some folks have had luck adding citric acid (which helps set wool dye like vinegar) to their water each time they bathe their wool. About using the pumice to remove pilling -- would this be just as effective on hand knit items? Do you need to lanolize each time you wash them? Is the lanolin removed by a normal wash? thanks! 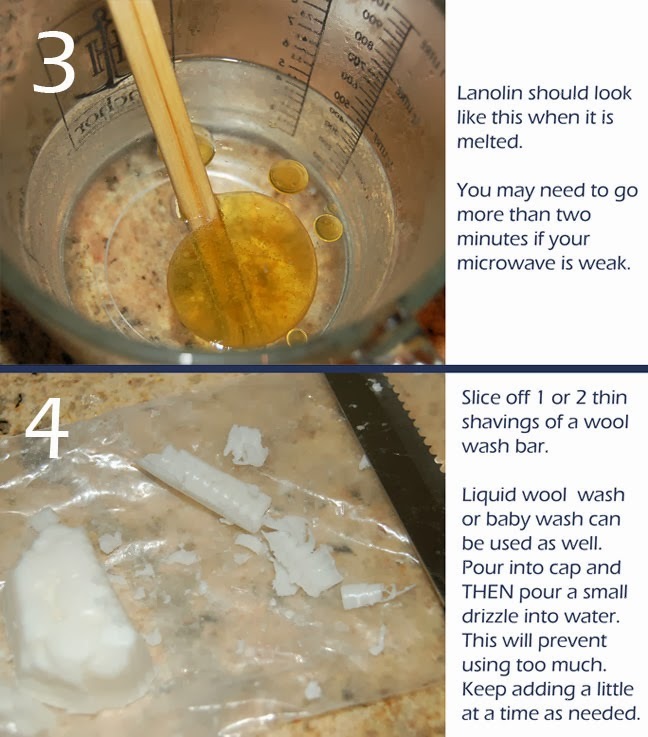 Why should we not use liquid lanolin? I just received some in the mail the day before I read this. I have solid for lanolizing, but bought liquid to rub into the wet zone to make it more bullet proof. If I cannot find those brands of lanolin is any 100% pure lanolin ok? Great article and details. One question - when you wash and then lanolise, you don't rinse before lanolising? I'm just getting started with homemade wool diaper covers for my first baby, and I'm so glad I found this post! This is an excellent resource. Thank you so much for sharing your knowledge and experience.